CROSSTABULATION: normal crosstabulation and INTER-RATERS AGREEMENT table,nominal statistics (chi-square, Pearson’s Phi, Goodman-Kruskal’s Gamma, Contingency coefficient), ordinal statistics (Kendall’s tau-b and tau-c, Pearson’s R, symmetric and asymmetric Somers’ D, Dxy and Dyx), inter-raters agreement statistics (percentage of agreement, Cohen’s Kappa, Scott’s Pi, Krippendorf’s r and R-bar, free marginal correction for nominal and ordinal measure), 3-D bar chart. ONEWAY ANALYSIS OF VARIANCE with post hoc tests (LSD, Tukey’s HSD, Scheffé’s test), effect size measures, error bar graph, barchart, deviation chart. RELIABILITY analysis with item, inter-item and item-total statistics, split-half reliability statistics, internal consistency measures (Cronbach’s alpha, etc.). NONPARAMETRIC analysis including binomial test, one sample chi-square test, runs test, McNemar test, Mann-Whitney U test, Wilcoxon t-test, sign test, Kruskal-Wallis ANOVA, Friedman two way ANOVA, Kolmogorov-Smirnov test for 2 samples and goodness of fit test, Moses test of extreme reactions, median test (2 or more samples). NONPARAMETRIC ASSOCIATION MATRIX including Spearman’s R, Somer’s D, Dxy and Dyx, Goodman Kruskal’s Gamma, Kendall’s Tau-a, Tau-b, Kendall Stuart’s Tau-c, etc. The data window is a spreadsheet like data editor where values can be entered, browsed, or edited..
Data file can store up to 2035 variables (or fields). Supports plain text as well as Rich Text Format documents. Imports comma or tab separated text files, DBase, FoxPro, Excel, MS Access, Paradox, Lotus, Quattro Pro, SPSS/PC+, and SPSS for Windows files. Exports comma or tab separated text files, DBase, FoxPro, Excel, MS Access, Paradox, Lotus, Quattro Pro, SPSS/PC+, and XML files. Allows merging and aggregation of data files. Supports variable and value labels and up to 3 missing values. Cases can be filtered using complex xBase expressions. Data grid may be sorted on one or several variables. Supports data transformation (including conditional transformation), recoding, ranking. Provides more than 50 transformation functions including trigonometric, statistical, random number functions. The Notebook window displays the statistical output for all analysis performed during a session. The notebook metaphor provides an efficient way to browse and manage outputs. The text output of each analysis is displayed on a separate page. Each page can be annotated or edited. Empty pages can be inserted to put down ideas or remarks, sketch an analysis plan, or write down interpretation of results. Tabs can be added to create sections in the notebook allowing storage of different kinds of analysis in different sections of the notebook. An index of all analysis is automatically generated. This index can be used to quickly locate and go to a specific page, move pages within the notebook, or delete some pages. Rich Text notebook allows one to change font attributes (bold, underline, strikeout, italic) and font colors. Highlight tool allows to color passages of text. Notebooks can be exported in Rich Text Format or in plain text. 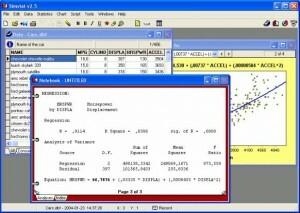 All high-resolution charts created during a session are displayed in the Chart window. This window can be used to view the charts and perform various operations on individual charts or on the entire collection of charts. For example, you can modify the various chart attributes, save those charts to disk, export them to another application using the clipboard or disk files, or print them. It is also possible to delete a specific chart or to modify the order of those charts in this window. Control of axis, titles, legends, colors, lines, etc. Charts can also be copied as tab separated values and imported by another charting application. The script window is used to enter and edit commands. Those commands can be either read from a script file on disk, typed in by the user or automatically generated by the program. When used with the RECORD feature, the script can also be used as a log window to keep track of the analysis performed during a session. Those commands may then be executed again, providing an efficient way to automate statistical analysis. Additional commands also allows one to create demonstration programs, computer assisted teaching lessons, and even computer assisted data entry. Record script feature to automatically generate commands corresponding to operations performed with menus and dialog boxes. Flow control features such as IF-THEN-ELSE statements, GOTO or GOSUB commands, RUN command to run external programs, etc. Multimedia features: play sound (.WAV), music (.MDI), and movie (.AVI) files, display graphics (.BMP) and text. Users will immediately notice SimStat 2.6’s updated interface. We have implemented a more modern-looking design, with additional icons for ease-of-use. Simstat data files are now stored in a single file (with a .ppj file extension), providing an easier way to manage projects (delete, rename, move, etc.). This will allow projects to be stored on folders synchronized through a network or in online storage (Dropbox, SkyDrive, etc.). Consequently, changes will no longer be saved automatically on disk, but will require the use of new, yet familiar SAVE and SAVE AS commands. SimStat now integrates the Report Manager features introduced in QDA Miner 3.0, allowing users to store documents, tables, graphics, and text outputs produced by QDA Miner, WordStat and now SimStat in a single location. The Report Manager is structured in an outline, allowing users to easily view, edit, reorganize and write draft versions of reports. NEW, EASIER TO USE FILE CREATION AND VARIABLE ADDITION DIALOG BOX. We have improved the dialogue boxes for project creation and for adding new variables to provide a more consistent interface between QDA Miner and Simstat. The SimStat case label feature has been improved to support the QDA Miner case descriptor feature. NEW FACTOR ANALYSIS MODULE (FORMERLY EASY FACTOR ANALYSIS ADD-ON). NEW CLASSICAL ITEM ANALYSIS MODULE (FORMELY STATITEM ADD-ON) FOR SCALE DEVELOPMENT AND TESTING OF MULTIPLE-CHOICE ITEM QUESTIONNAIRES. IMPORTATION OF MICROSOFT ACCESSS DATA FILES. NOTEBOOK WINDOW NOW STORES RESULTS IN RICH TEXT FORMAT (FIXED FONT).